August 30, 2009  The previous world record for the most people simultaneously dancing to the ground-breaking 1983 video was a meager 242 at the College of William and Mary earlier this year. Mexico City planned to obliterate that record. August 19, 2009  For many Americans, Cuba is the Caribbean's forbidden fruit. 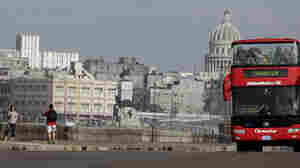 Now, legislation is pending in Congress that would lift the ban on U.S. citizens traveling to Cuba. As many as 1 million Americans might visit the island each year if permitted. But is Cuba ready for the influx? August 13, 2009  More than 100,000 fans filled Mexico's Azteca Stadium Wednesday for the World Cup qualifying match between Mexico and the U.S. The Americans hoped to break a 72-year losing streak on Mexican soil, but Mexico City's altitude was against them. August 6, 2009  Cuba's state-run economy is facing its greatest test since the fall of the Soviet Union, and President Raul Castro has launched a quiet revolution to improve the country. But the reforms are not expected to lead to capitalism anytime soon. August 2, 2009  I had no intention of driving across Cuba. I had a one-week visa, and I didn't want to spend much of that time in a car. But in Cuba, sometimes what you want, what you counted on, what you demand isn't available. July 27, 2009  In a speech marking Cuba's Revolution Day, President Raul Castro called on people to revitalize Cuba's underused farmland. 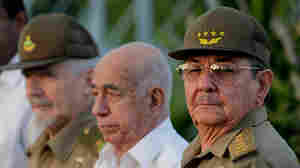 Last year, Castro launched a program to redistribute state-owned farmland in an effort to break Cuba's crippling dependence on food imports. July 26, 2009  Fifty-six years ago, Fidel Castro, his brother Raul and Che Guevara led what proved to be a disastrous attack on the Moncada army barracks in eastern Cuba. Although most of the revolutionaries were killed or captured, the Communist government celebrates the battle as the first blow against dictator Fulgencio Batista. July 17, 2009  Soy Sauce, from the Mexico City-based Mexican Institute of Sound, pushes eclecticism to a new level. It combines mariachi with hip-hop, rock and electronica. Tossed in are elements from political speeches and the barnyard. July 6, 2009  The global recession has hit Mexico harder than most other countries in the region. Mexico is suffering a drop in exports to the United States, a decline in remittances from Mexicans living and working in the United States, the continuing impact of swine flu on tourism, and the shrinking of the oil sector. June 30, 2009  The U.N. General Assembly unanimously condemned the military takeover in Honduras and demanded that Manuel Zelaya be immediately returned to power. Zelaya, who was forced into exile in Costa Rica, vows to return to Honduras. The new administration says he will be arrested if he does. June 29, 2009  The first military takeover of a Central American government in 16 years is drawing widespread condemnation from governments around the world. The democratically-elected president of Honduras was ousted Sunday and a successor has been named. But President Manuel Zelaya is vowing to stay in power. June 25, 2009  The Mexican capital is a noisy metropolis of more than 20 million people, known for its colonial church bells and relentless traffic. But it's also a place where sounds have meaning. If you listen just right, amid the chaos, a disjointed symphony is waiting to be heard. June 24, 2009  A new U.S. government report says 87 percent of the guns seized by authorities in Mexico's drug war are traced back to the United States. Mexican drug cartels find it much easier to obtain firearms north of the border. There are tens of thousands of licensed gun shops in the U.S. There is just one in Mexico, and it's run by the army. June 17, 2009  The Mexican government says it is making progress in the battle against the country's drug cartels. But despite some gains, drug-related killings continue at an alarming rate in parts of Mexico. Some critics say President Felipe Calderon's war is misguided, mismanaged and unwinnable. June 6, 2009  A killing spree has resumed in Ciudad Juarez, Mexico's most violent city. A lull in murders followed after the Mexican army took over the city's police department two months ago. Now, there is a resurgence in executions — some in broad daylight, and at a pace far higher than a year ago.